The Mulva Library was built with your needs in mind. Our spaces are state-of-the-art and equipped for whatever you’re working on. 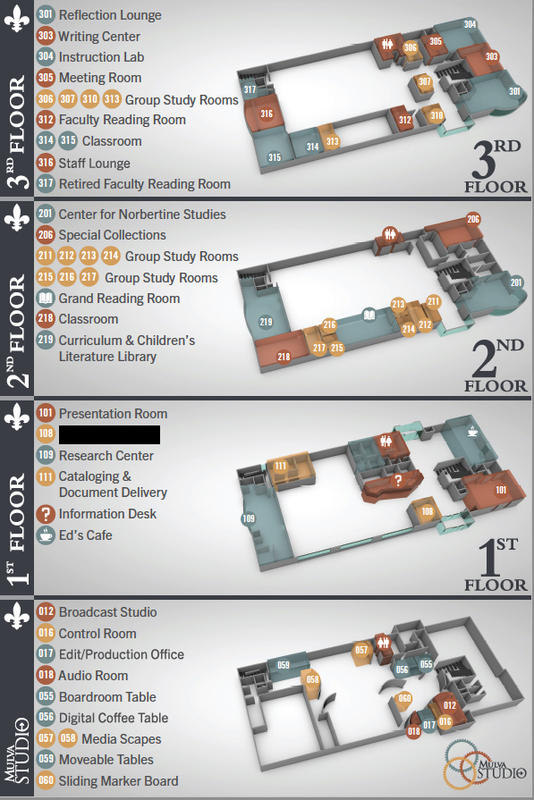 There are a variety of areas in the library you can reserve for use through the campus’ room reservation system. Most have flexible furniture and also vary in their available technology. View the tables by level below or our floor map to find the ideal combination of space and equipment to fit your needs. And don’t forget to check out remotes, cords and other equipment! If you need assistance, talk to our staff at the information desk, contact us at 920-403-3466, email library@snc.edu or chat with us online. View photos of the Mulva Studio on Flickr. View photos of the first floor on Flickr. View photos of the second floor on Flickr. View photos of the third floor on Flickr. For use by SNC community when no instruction is scheduled. Check reservations posted by the door to see if a class is in session before entering. Interested in information literacy instruction or using this space for class? Contact Kristin Vogel.